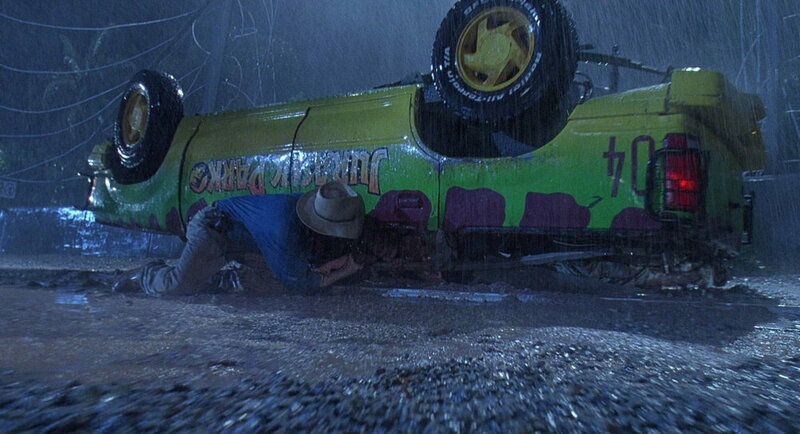 To create a drivable replica of the Jurassic Park tour vehicle as featured in the 1993 summer blockbuster HIT. 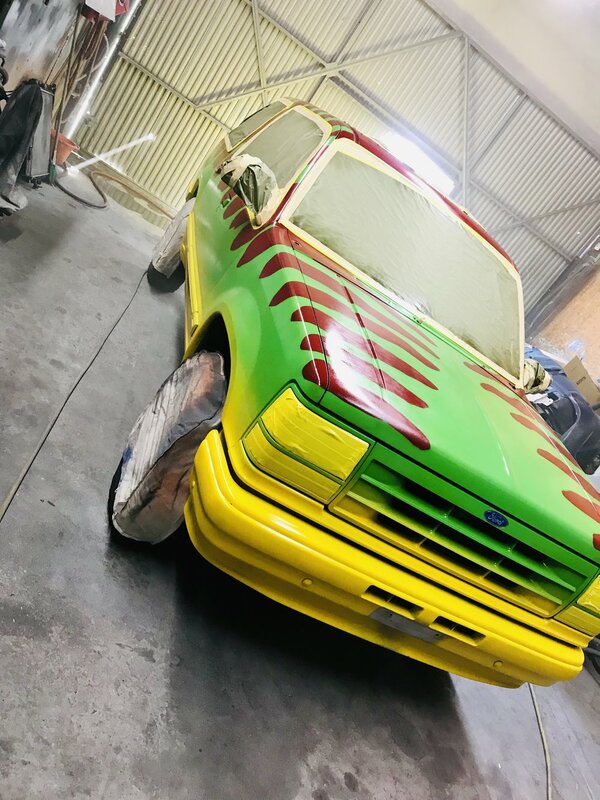 After months of searching, one of the guys was able to track down a PRISTINE 1991 Ford Explorer for sale. This was a perfect model for the project. Following in the footsteps of some extremely talented ENTHUSIASTS across the globe who have accomplished this very same feat, the guys are on their way to almost having their build completed. Maxwell Morrow, Justin Mulcahy, Stanley Chen, Noa Rosenberg, Logan Adams, Eleanor Goodall, Jonathan Theriault, John Skinner, and Ron Vallejo. 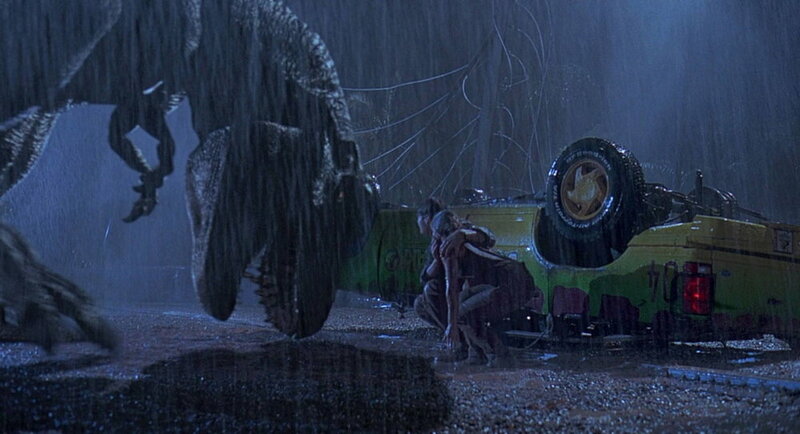 This Jurassic Park vehicle replica project was not meant to fulfill just one dream, but something bigger. We want this very recognizable vehicle to help promote the adoptions of animals, especially those in high-kill shelters. Once the vehicle transformation is complete, we plan to partner with multiple shelters and organizations by attending various pet adoption events and festivals. 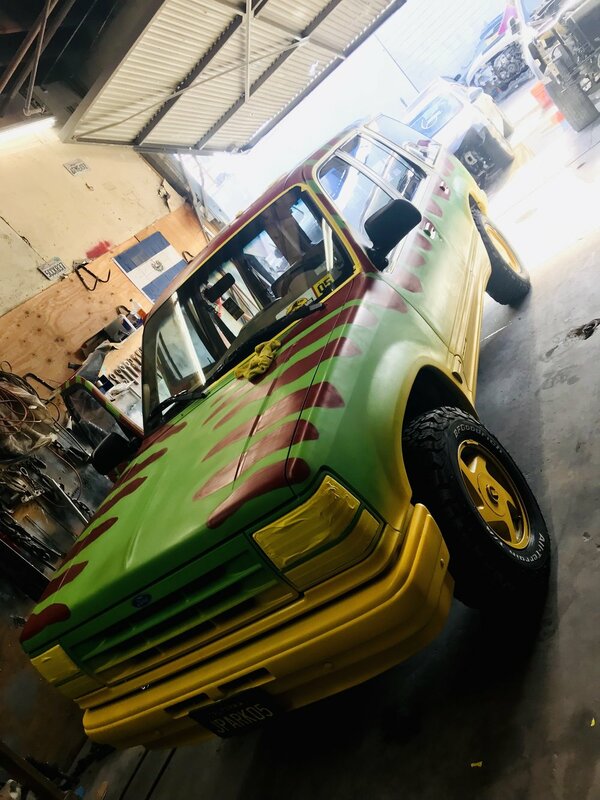 Not only will you be able to see the Jurassic Park 05 vehicle and take your photo with it, but you might just adopt your very own Rex or Rexy to take home with you. We are not a charitable organization or company. We are simple huge fans of the Jurassic Park franchise and huge fans of animals, especially rescues. The vehicle will travel throughout Southern California, at various events and locations, promoting the adoption of animals. We have a Calendar of Events section that will be updated with locations of where you can see the vehicle, and hopefully adopt a new member of your family. We hope to help minimize the euthanasia of these loving creatures. Approximately 6 to 8 million animals are handled by animal shelters in the U.S. each year. Even though some are reclaimed or adopted, nearly 4 million unwanted dogs and cats are left with nowhere to go, and end up being euthanized. We hope to help lower that number and help families and individuals gain a new friend (or more) who know nothing but to love. If you already have a pet, you know exactly what we're talking about. Brock Afental, Brandon Constant, Nic Cornett, Derrick Davis, Cirrus Drake, Brogan Fullmer, Ryan Glass, Elliot Hansen, Stephen P Hatton, Victor Hugo, Brandon Ragon, Adam Mark, Jeff McClure, Ari Morris, Greg Smith, and so many other JP Motorpool Members. If we missed anyone, we apologize and would love to include you/them, so please just let us know. without the time-saving information and references provided by JPmotorpool.com, this project would likely take a lot longer to complete. Brandon's videos and posts have been so inspirational and beyond helpful in accomplishing this build. I can't fully express how grateful I am to him for sharing his knowledge and talents with the world. 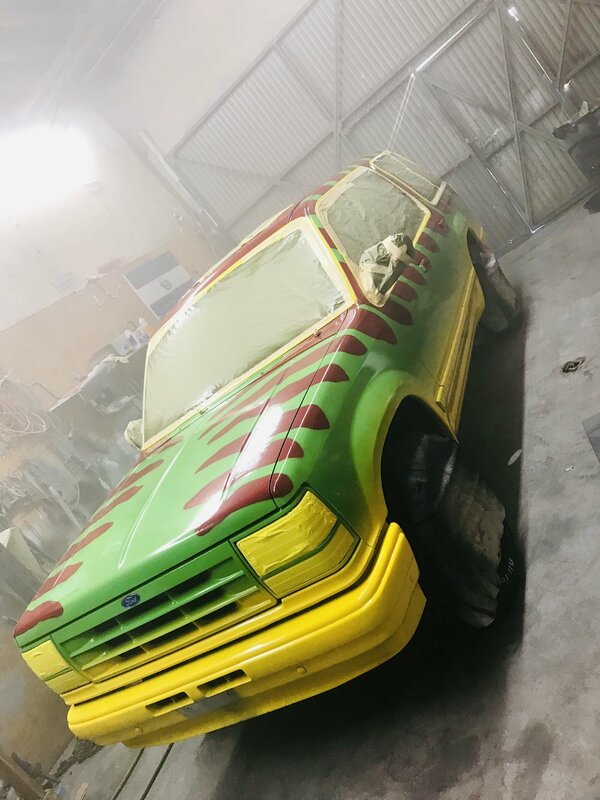 Earlier this year, Fellow explorer builder Greg Smith, shared a post with other Jurassic Park Motorpool Explorer Builders. After doing a run of the Tail Light Guards, he announced he was Doing a run of The Go Rhino Brush Guards as well. Thanks to Brandon Constant, who Let him Borrow One To Use As A Pattern, Greg was able to work out a deal with his Fabricator and began a run of these brush guards for those of us who are building our own Jurassic Park Explorers. All of these guys have shared their knowledge, inspired us, motivated us, and helped us follow our dreams. We can't thank them enough. The jurassic Park Motor pool is family. A large part of this project is the dome roof, a huge challenge and major piece that makes this vehicle one of a kind, IDENTIFIABLE, and practically identical to the one that appears in the film. Production Designer, Justin Mulcahy of SceneryLA, a scenery company based out of Los Angeles, has lead the team in taking on this very challenging portion of the build, as well as giving direction on many other aspects of the project. Justin has contributed much of his own time to this project, and we can't thank him enough for his vast knowledge and work on this build. These guys, brothers, are owed so much credit. Richard Gomez, owner of The Post movie ranch in the antelope valley, is credited with finding the vehicle and getting the sale situated. He also lead the team in performing mechanical repairs and allowed us to use his shop to do so. Rich also works in film, and is a wonderful scenic carpenter if you ever need one. Aside from the beautiful location, THE POST also offers trained horses and other live animals for your next project. Richard's wife, Amanda Gomez, is an UNBELIEVABLY talented high-end chef and desert aficionado. If you're lucky enough to book THE POST for your next photoshoot, film shoot, wedding or event, you're going to be in for a real treat (literally) if you request and add their catering options. David Escobar of ScenicandCreate, prop master and scenic carpenter, is now a full time employee with Northrop Grumman. We will (eventually) convince him to come back and work in film again. Both him and his talents are missed. Devon Mascarenas of ArtByDam, is an extremely talented scenic carpenter and artist. He is our go-to for many projects. The guy is solid, and a ridiculously hard worker. He can design and build almost anything and won't let you down. Matthew Scott Miller of HyperfocusCreations, or "Butter" as we like to call him, is a multitalented scenic painter and prop master. He has now parlayed his abilities into the acting world, quickly creating a new career for himself and appearing in such award-winning shows as Westworld. 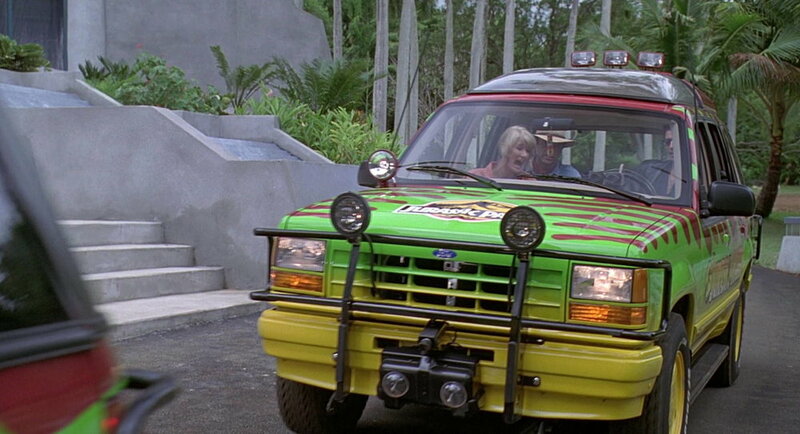 WHERE CAN YOU SEE THIS JURASSIC PARK TOUR VEHICLE REPLICA? 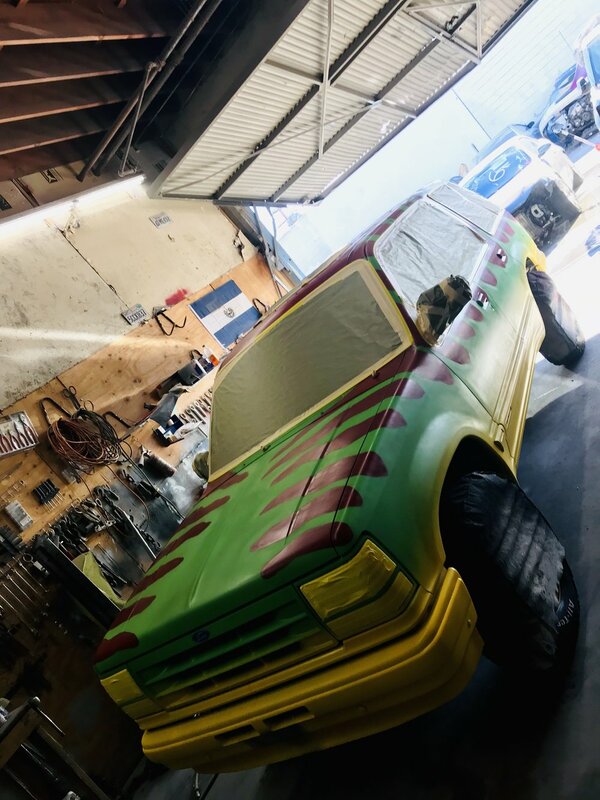 Once complete, if you live in the Los Angeles area and other parts of SoCal, chances are very likely you'll spot the Jurassic Park 05 vehicle almost on a daily basis. The owner, Jonathan Theriault, works in film and travels all over throughout the Los Angeles area. You may see him driving through Downtown Los Angeles, Hollywood, Santa Monica, all over the San Fernando Valley, Santa Clarita, and many other locations, on any given day. Guaranteed appearances will be at some JPMotorpool Assignments, and several Pet Adoption Events. You can find the dates and locations for these events on the calendar here. WE WERE HONORED TO WORK WITH AN AMAZING ARTIST AND MURALIST WITH AN ARRAY OF KNOWLEDGE IN THE ARTS, GRAFFITI, CULTURE, MURAL, AND STREET ART HISTORY ACROSS THE GLOBE. JOSEPH MONTALVO, WHO GOES BY “NUKE,” IS A STAPLE HERE IN Los Angeles AND MEXICO. UPON WORKING WITH HIM ON A PRODUCTION EARLIER THIS YEAR, WE TOLD HIM ABOUT OUR PROJECT. HE WAS SO STOKED ABOUT IT AND OFFERED TO TAKE ON THE TASK OF PAINTING OUR EXPLORER. 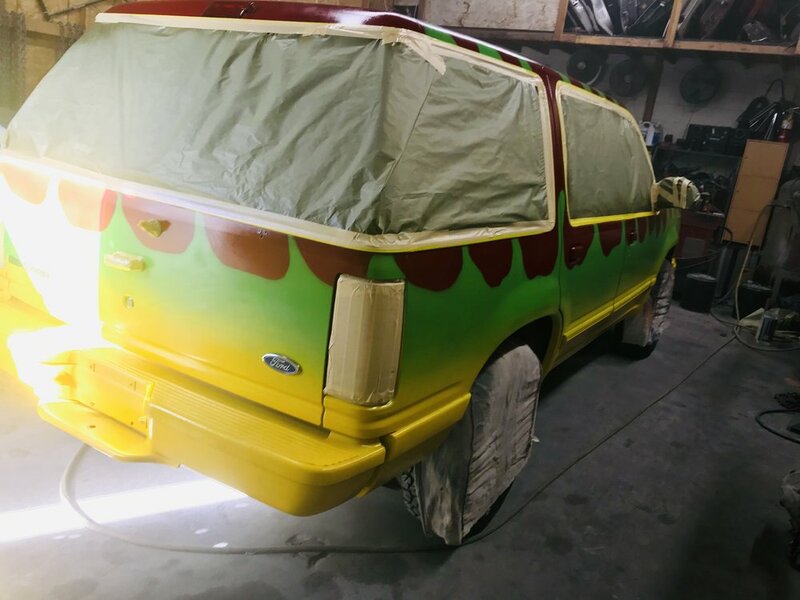 WE MAY BE WRONG, BUT WE BELIEVE OUR VEHICLE IS THE FIRST Jurassic Park EXPLORER TO BE PAINTED WITHOUT THE USE OF ANY STENCILS OR VINYL WRAP (ASIDE FROM THE LOGOS). HE PAINTED THE VEHICLE COMPLETELY FREE-HAND USING MONTANA SPRAY PAINT. WE ARE ABSOLUTELY BLOWN AWAY BY HIS TALENT AND SKILLS, AND WE ARE BEYOND APPRECIATIVE FOR HIS TIME AND WORK ON THIS PROJECT. WE WOULD ALSO LIKE TO EXTEND A VERY SPECIAL THANKS TO LUCY AT MONTANA PAINTS IN DTLA. SHE WAS ALSO EXTREMELY HELPFUL, EVEN OPENING UP SHOP ON A CLOSED DAY FOR US. THANK YOU MONTANA SPRAY PAINT! WE WOULD ALSO LIKE TO EXTEND A VERY SPECIAL THANKS TO RAFAEL AND RICK FOR GRACIOUSLY ALLOWING NUKE TO PAINT IN THERE SPACE. WE WILL BE PROVIDING VIDEO FOOTAGE OF THE PROGRESS AND SPOTLIGHT ON NUKE SOON, SO STAY TUNED. FOLLOWING THE AMAZING FREE-HAND PAINT JOB NUKE DID WITH THE EXPLORER, WE WERE INTRODUCED TO ANOTHER AMAZING GOOD GUY HERE IN OUR COMMUNITY. WE REACHED OUT TO JUAN CARLOS MARTINEZ OF JC AUTOBODY & PAINT AND TOLD HIM ABOUT OUR PROJECT. BECAUSE THE MONTANA SPRAY PAINT WE USED WAS A FLAT BASE, WE NEEDED A CLEAR COAT APPLIED TO GET THAT SHINE. JUAN WAS UP FOR THE TASK. WE ARE SO THANKFUL FOR HIS HELP ON THE PROJECT. We were lucky enough to get our hands on a set of BF Goodrich tires, similar to those classic and indistinguishable tires that appear on all of the vehicles in the JURASSIC PARK film. Unfortunately, the Screen-Used "BFGoodrich Radial All-Terrain T/A" tires were discontinued. The good news is, The KO2 replaced the KO, which is very similar, but has bigger tread. 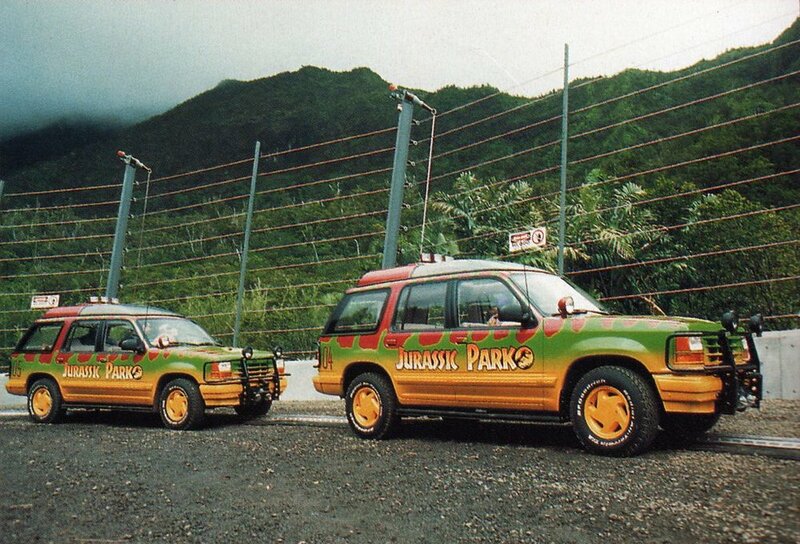 As seen in the iconic film, the seats in the Jurassic Park Tour Vehicles were customized. The front seats were cut down to be Shorter and all of the seats received a custom upholstery job. The photo to the left of custom seats are from another JPMotorpool member and owner of Jurassic Park Tour Vehicle 05. We found an amazing company based out of the city of North Hills who are taking on this part of the project. The talented folks at Miranda's Upholstery are always available and can customize and modify any project you take to them. As you know, the Jurassic Park Tour Vehicle has multiple lights, 2 interior video monitors, video cameras, a radio, and more. To power all of this, we plan on using an optima YELLOWTOP BATTERy 34/78 Dual Terminal. What inspired the name "adopt a rex"
About 6 years ago, we adopted a small puppy. The little Chihuahua mix was found in an abandoned litter under a porch in Los Angeles. The rescue organization we adopted him from described him as being "the timid one of the group," and they definitely weren’t kidding. Over the course of a year and a half, Ryder became less timid, but still suffered from extreme separation anxiety. After a recommendation from our vet, we made the decision to foster a second puppy to see if it would help tame his anxiety. By chance one day while shopping at a Home Depot, there was a small tent set up out in front of the store with a bunch of crates and animal pens. Amazingly, this was another rescue organization offering pet adoptions and requesting foster parent applications. In one of the pens, we found a little German Shepherd mix looking sadder than ever. The rescue staff said he was found alone in the desert wandering along the road in Antelope Valley. At the time he was found, they think he was only a couple months old and he was severely ill. 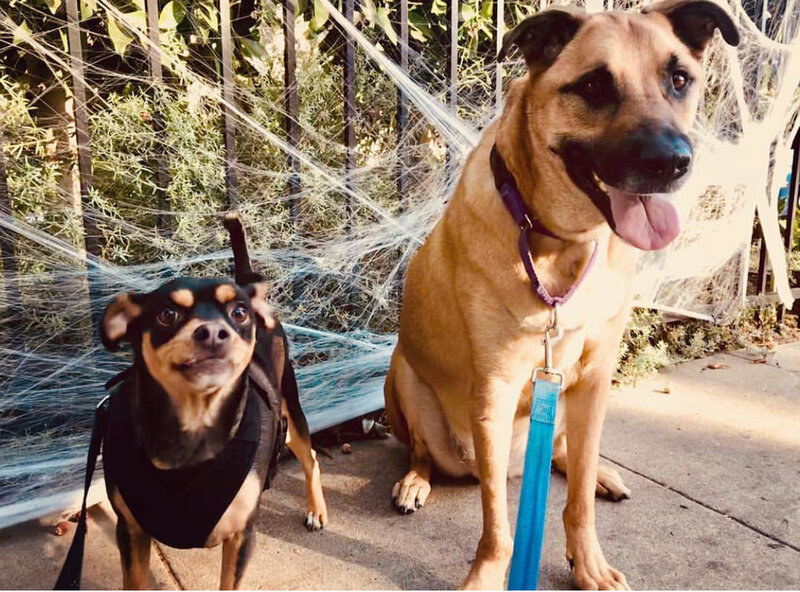 Since fostering and adopting our amazing new family addition, Rex, had experienced several bumps in the road with his health in the years that followed. 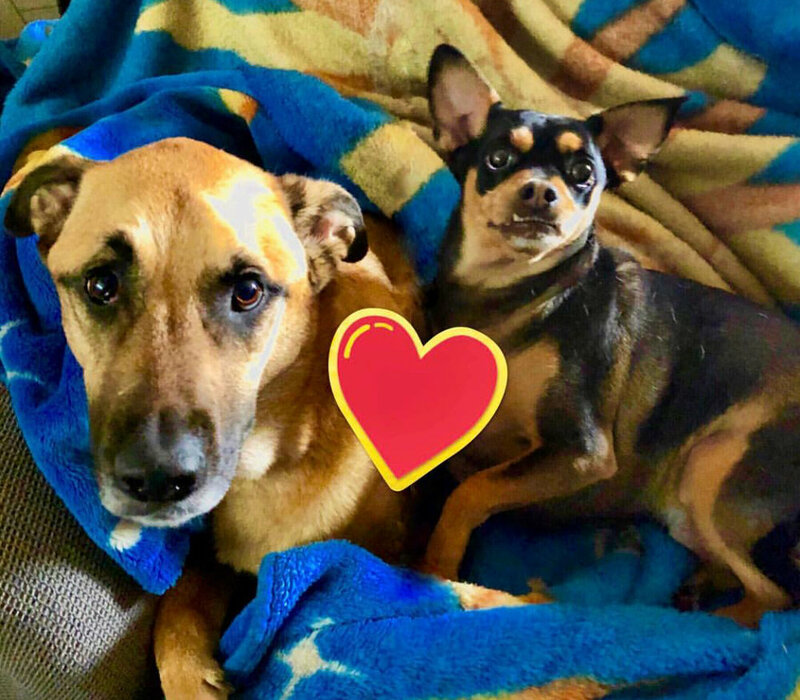 With the help of so many, especially those in the JURASSIC PARK fan community, Rex was able to regain his health through GoFundMe donations, helping support the costs of multiple surgeries and lifelong medication. Jack De la Mare, Chris Pugh, & Asees Sandhu of JurassicOutpost.com for sharing Rex's story early on. Without you guys helping us get the word out, Rex may not be here today. WE ALSO WISH TO THANK THE FOLLOWING AMAZING INDIVIDUALS. 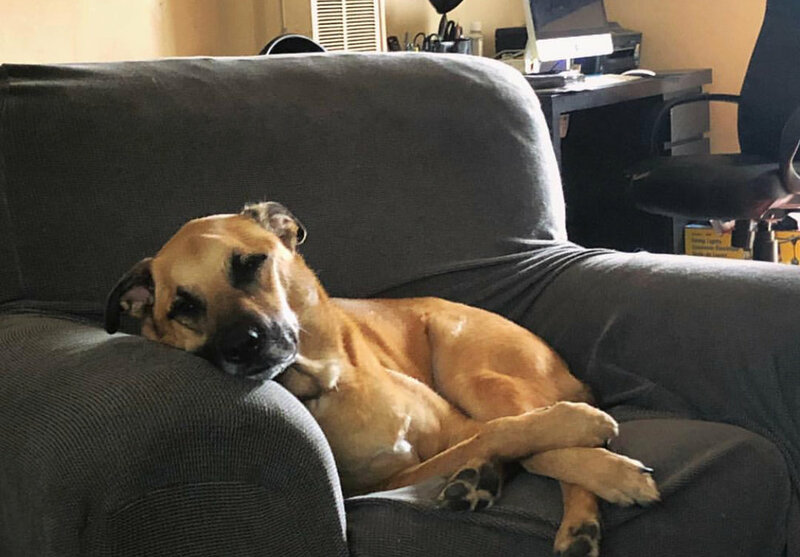 After reading Rex's story, you may ask yourself "why would I adopt a pet when all of these health problems and medical costs are a possibility with adoption?" 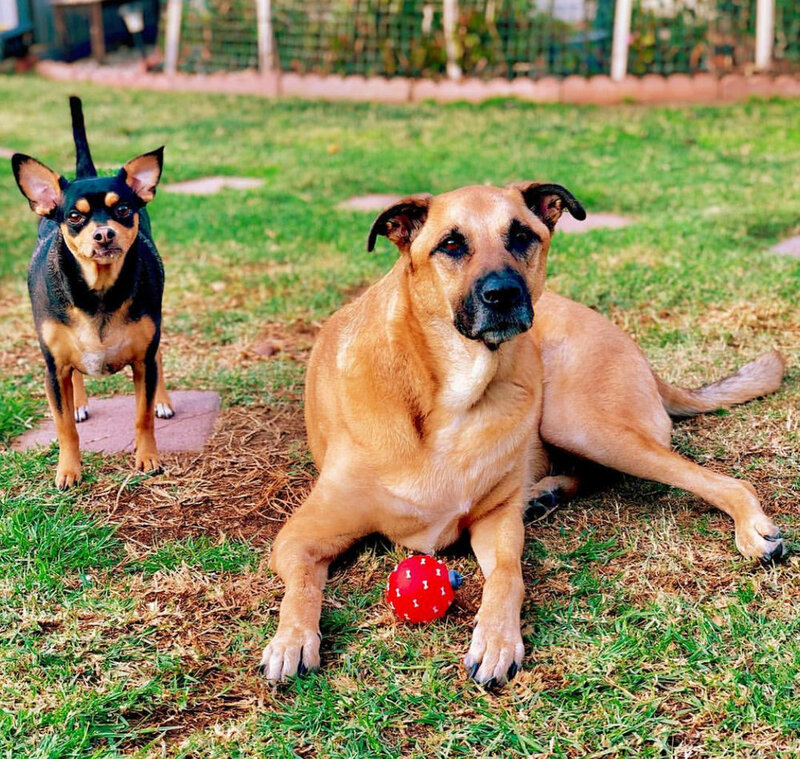 The truth is, these issues are a possibility with any pet you get, whether it's through adoption or purchasing through a pet store or breeder. Yes, what we went through with Rex was extremely stressful and disheartening, but we we do it all over again if we had to. Rex has brought so much love and joy to so many. He is extremely special, and one of a kind. Thinking of adding a "REX" to your family? Here are 10 reasons to adopt your new best friend. 1. Because you'll save a life. Each year, 2.7 million adoptable dogs and cats are euthanized in the United States, simply because too many pets come into shelters and too few people consider adoption when looking for a pet. The number of euthanized animals could be reduced dramatically if more people adopted pets instead of buying them. When you adopt, you save a loving animal by making them part of your family and open up shelter space for another animal who might desperately need it. Animal shelters and rescue groups are brimming with happy, healthy pets just waiting for someone to take them home. Most shelter pets wound up there because of a human problem like a move or a divorce, not because the animals did anything wrong. Many are already housetrained and used to living with families. 3. Because it’ll cost you less. Usually when you adopt a pet, the cost of spay/neuter, first vaccinations (and sometimes even microchipping!) is included in the adoption price, which can save you some of the up front costs of adding a new member to your family. Depending on the animal, you may also save on housebreaking and training expenses. No one needs to see another selfie—unless it’s a selfie of you with the adorable pet you just adopted! Adopt a pet, post those pictures and let the well-earned likes roll in. If you buy a dog from a pet store,online seller or flea market, you’re almost certainly getting a dog from a puppy mill. Puppy mills are factory-style breeding facilities that put profit above the welfare of dogs. Animals from puppy mills are housed in shockingly poor conditions with improper medical care, and are often very sick and behaviorally troubled as a result. The moms of these puppies are kept in cages to be bred over and over for years, without human companionship and with little hope of ever joining a family. And after they're no longer profitable, breeding dogs are simply discarded—either killed, abandoned or sold at auction. These puppy mills continue to stay in business through deceptive tactics — their customers are unsuspecting consumers who shop in pet stores, over the Internet or through classified ads. Puppy mills will continue to operate until people stop supporting them. By adopting a pet, you can be certain you aren't giving them a dime. 6. Because your home will thank you. 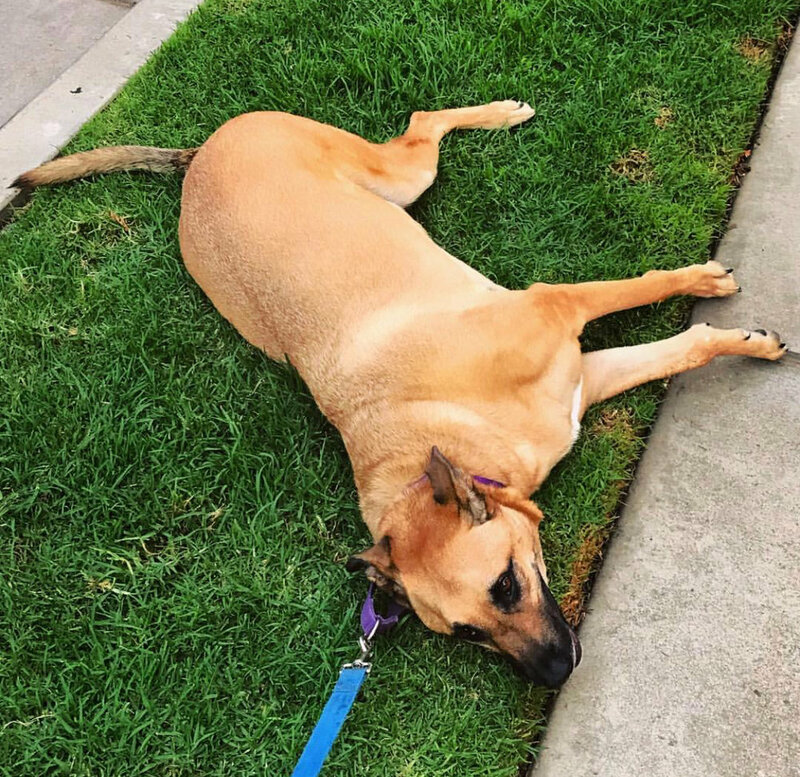 Many of the pets from shelters and rescues are already housetrained, which means you’re not only saving a pet’s life, you may be saving your rug. Adopting a mature pet not only gives older animals a second chance, it often means introducing them to your family will be much easier. 7. 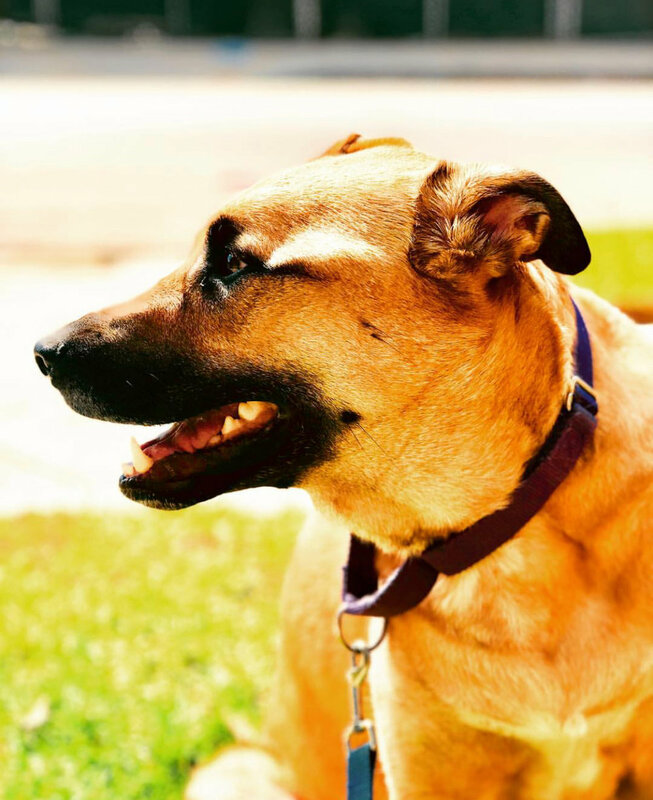 Because all pets are good for your health, but adoptees offer an extra boost. Not only do animals give you unconditional love, but they have been shown to be psychologically, emotionally and physically beneficial to their companions. Caring for a petcan provide a sense of purpose and fulfillment and lessen feelings of loneliness. And when you adopt, you can also feel proud about helping an animal in need! 8. Because adoption helps more than just one animal. Overburdened shelters take in millions of stray, abused, and lost animals every year, and by adopting an animal, you’re making room for others. Not only are you giving more animals a second chance, but the cost of your adoption goes directly towards helping those shelters better care for the animals they take in! 9. Because The Shelter Pet Project makes it easy. You can go to the Shelter Pet Project to find pets near you, of every size, color, temperament and breed. Purebred and mixed breed animals alike are waiting for their forever homes! And get a new best friend out of the deal. Seriously, what could be better than that? LIFE IS ABOUT CREATING AND LIVING EXPERIENCES THAT ARE WORTH SHARING.